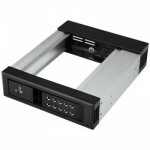 This removable hard drive hot-swap bay makes it easy to swap 3.5â€ SATA or SAS drives in and out of your server or desktop computer, using an available 5.25â€ front drive bay. It features a trayless design that saves you installation time and enables you to insert or remove drives as needed, creating a convenient solution for drive maintenance and interchangeability of data between multiple systems. This hot-swap bay/mobile rack is ideal for IT professionals, such as system administrators or computer operators, for quickly swapping, replacing, or transporting drives between various systems and locations. With support for both SATA and SAS 3.5â€ drives, it saves valuable time in environments where storage drives need to be replaced or removed regularly, such as in server rooms and data centers. The hot-swap bay provides a protective backplane with a durable aluminum housing that offers ventilation to ensure proper air flow and heat dissipation. To safeguard your data, you can lock the drive bay door to prevent unauthorized access to your drive. To maximize the speed and performance of your drives, the mobile rack supports SAS I and II and SATA I, II and III, providing data transfer speeds up to 6Gbps when paired with a compatible controller. The HSB1SATSASBA is backed by a StarTech.com 2-year warranty and free lifetime technical support.